The company was established in 1990 with the name KF "Geoprecise." In 1994 it was re-registered as "Geoprecise Engineering" Ltd. 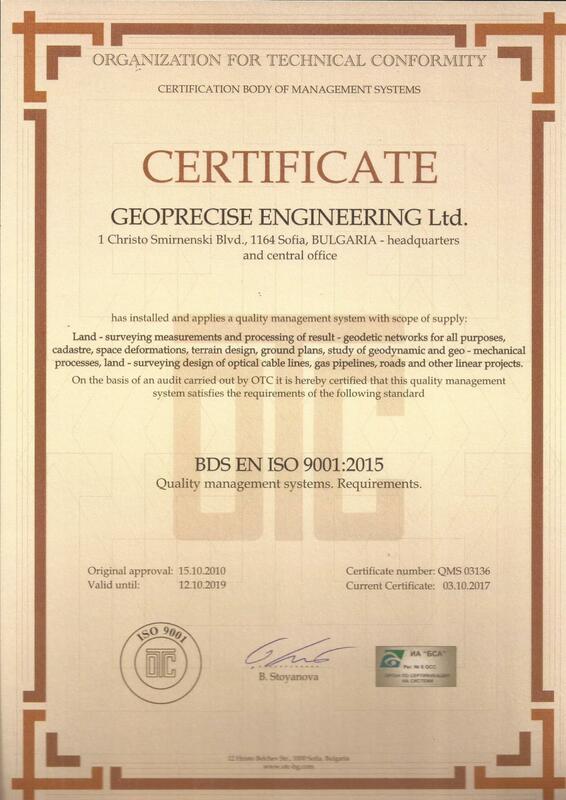 The company is recognized as the market leader, not only because of the wide variety of geodetic services, but also because of the responsibility for each project. Geoprecise Engineering Ltd. has rich experience in the field of geodesy - cadastre, deformation monitoring, design, analysis, studies, creating digital models, databases and more. The company is proud of its highly qualified team and wide technical expertise. Company specialists have developed "Instructions for determining the coordinates of points with the help of the Global Positioning System. The team of professionals has a solid knowledge and skills thanks to which your project will be in the hands of reliable partner. 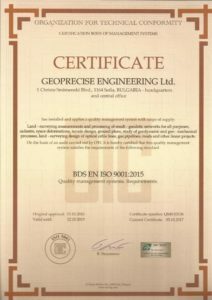 Geoprecise Engineering Ltd. is an extremely reliable partner with a highly qualified technical staff and modern geodetic equipment and software. Eng. Ilko Iliev - Executive Director of PROVADSOL Ltd. The company has a highly qualified team and the necessary precise technique, giving a guarantee for professional performance of contracts assigned to them. Dr.-Ing. E. Bogdantsaliev - Executive Director - HIMCOMPLECT ENGINEERING Ltd. The company has a team of experts who will give you the best technical advice and professional performance of the contracts. Olga Angelova - Solvay Sodi Ltd.
All activities are performed professionally and in accordance with regulatory requirements. Kiril Temelkov - Executive Director of "Bulgartransgas" Ltd.
As your trusted partner in every project, we are responsible to share our experience, knowledge and skills to provide you quality services and care that you need.